Shirdi Sai Baba Temple Information. : Leelas of Sai in the life of Meenakshi Sundaramji-Founder Bhairava Sai Mandir-part 2. This post is in continuation of Sai leela experienced by Sai devotee,Sai Bhairava temple priest -Shri Meenakshi Sundaram ji .Please read the next part of the leela.These Sai experiences experienced by Meenakshi Sundaram ji shall be posted part by part .Devotees who miss any of these leela can go at the end of the post and click on given links to read the missed out post .Jai Sai Ram . In 1976 I incurred some unexpected expenditure and was greatly perturbed whether I could undertake a trip to Bombay. But what happened struck me with wonder. Some years ago I worked in a company for some days. But I did not get the payment for my short service. As I was deputed by the company in which I am working now to go to various places on official duty often I had not the time to get the amount. I did not bother about the amount at all. Suddenly on a day prior to my departure to Shirdi, I happened to meet the Accountant of the company in which I worked formerly. He told me that the amount payable to me was in suspense account and asked me to come to his office and get the amount. It was Sri Sai Baba who arranged my meeting with the Accountant. I had no need to postpone my trip to Shirdi. So going to my former office and getting the amount I reserved the railway ticket to Shirdi. This was an incident which revealed Sai Baba’s grace. In 1977 I got Sri Sai’s permission to go over to Shirdi and wanted to stay there as long as Sai Baba wanted me to stay. I started earlier than I intended. But my hasty decision made me experience a lot of problems on my journey. Each time I got into a wrong bus and had to spend extra money. I lost sleep. At last I reached Sholapur. I rested at the station in the first class passenger’s room and cried to Sri Baba that I would not go against his wishes. I prayed to him that the rest of my journey should be smooth. From Sholapur I returned home comfortably. If I behave disrespecting Sri Baba’s wishes I would suffer. Since I underwent this experience without asking for Sri Sai’s permission I would not do anything against the Lord’s wishes. In 1978 there was a problem in my office. In a Government factory at Jabalpur a big machine was functioning for four years. But the Indian Agency commission amounting to two lakhs of rupees had not been paid. Many went there many times, but the amount was not paid. My office order was that I should seek the help of a foreign engineer to check the machine. I should submit the relevant documents on the recommendation of the engineer and get the amount due. I meditated on Sri Sai Baba and asked him whether I could go to Jabalpur. With his permission I went to my office and told my officer that I would return with the amount. The foreign engineer reached Jabalpur by plane. At the time of inspection by the engineer Government officials should be present. As soon as I reached Jabalpur I took the foreign engineer and went to the Government factory. I met the officials there and discussed with them the arrangements. We arrived at the decision that the inspection could be done as early as possible. I took the engineer and showed him the machine. Inspecting the dust-laden machine he said that he could not carry out inspection of the machine. He said that as the machine had not been used for long there was a layer of ¼ inch-thick dust on it. He left for Bombay that night itself. I was shocked. How could I get the money without inspection of the machine? I had told my officers that I would return with the amount due. I prayed to Baba. I told Baba, “I shall come tonight to Shirdi. Please save me from this problematic situation.” I told my officers on the telephone that the inspection could be done the day after tomorrow as the foreign engineer was not willing to carry out the inspection. 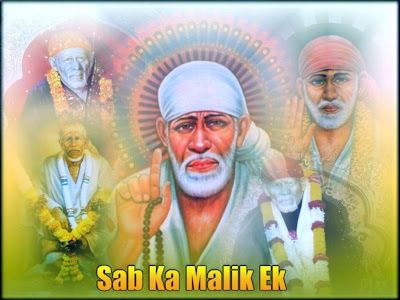 On the afternoon of the next day I went to Shirdi and meditated on Sri Sai. I prayed to him to save me from a crisis. When I was travelling that night Baba suggested to me in a dream a good idea. According to the idea I went to the authorities of the company and asked them what kind of work has been carried out in the machine? I noted down all that they said. I brought to the attention of the higher authorities the kind of work done by the machine. I asked them why a machine in such good condition should be re-inspected. I went to production engineer gathered more details. I wrote down all the details in a paper and got the engineer’s signature on it. I took the paper to a higher authority and asked him why should the machine in good condition be stopped from functioning for two or three days? I told him that the static test was not necessary. I informed him that bills had not been paid for two or three years. The officer concerned seeing all the details in my paper asked me to resubmit the bills. He promised me that the payment would be made. I took the bills with me to the accounts Department and got them signed by the higher authorities. I got the amount due. At about 10 a.m. the next morning I got a cheque for Rs. 2lakhs and returned to my place. From this I learnt if I pray to Sri Sai Baba sincerely and appeal to him and beseech him, He will certainly help me. I began to believe that Sri Baba will solve my problems if I pray to him with intense devotion relying on Him and him alone. 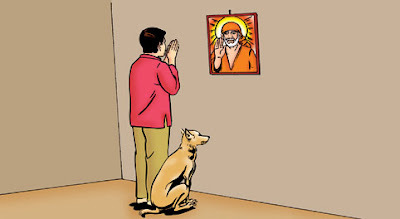 When each year I travelled to Shirdi I would pray to Lord Sai Baba to give me a good, faithful dog. I wanted to be like a faithful dog to him. In 1978 when I was going along a road on a Wednesday night an old man seeing a tiny dog roaming about without protection in the street asked me to take it and rear it. I was about to take that dog. I realized later that I was in a dream. It was a Thursday morning. When an English newspaper fell on me I woke up from the dream. On that Thursday morning at about 10 a.m. when I was going to the harbour on official duty a muslim boy was taking a ten-days old pup brought form Tibet. As his religion did not allow him to rear a dog at home he brought it out. I was attracted to that dog. I was observing it. As I was going on official duty I did not know whether to take it with me or not. That boy enquired of my address and came to my house in the evening along with the dog. He entrusted it to me. He said he wanted no payment for the dog. But I paid him Rs.15/- saying something he left. From that day onwards that dog has been growing in my house as one of my children. 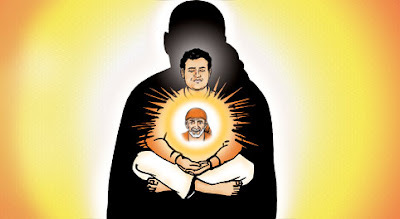 I consider it Sai Baba’s gift. (About this leela it is already mentioned in the first post of Sai temple Bharava.Devotee who have missed it can read it Here. 1.Bhairava Shirdi Sai Baba Temple -Chennai. 2.Leelas of Sai in the life of Meenakshi Sundaramji-Founder Bhairava Sai Mandir.